George Jones: The Voice Of Heartbreak Country music legend George Jones, who died today at 81, made a career out of turning hard living into heartbreaking songs. He could pull and bend notes until they made listeners hurt. In 2010, Jones told NPR's Melissa Block, "I try to live the song during that three minutes." George Jones died on Friday, April 26, 2013 in Nashville, Tenn. He was 81 years old. Jones, who had a voice that he could bend and pull to make listeners feel his pain, made a career of turning hard living into heartbreaking songs. In 2010, he spoke with All Things Considered's Melissa Block for an installment in NPR's 50 Great Voices series. On the front porch of George Jones' sweeping estate south of Nashville are two round tiles, each with a drawing of a rocking chair and a slash through it, a reminder that he doesn't need your rocking chair. Jones is perfectly tailored, wearing ostrich-leather shoes and that impeccable swoop of white hair. He performed about 90 concerts this year at age 79. Retire? No way. "I don't know what I'd do with myself," Jones tells All Things Considered host Melissa Block. "We don't wanna lay down and give up just 'cause we're old. Young people think we're crazy. Oh, one morning you'll wake up and look in the mirror like I did and say, 'What the devil happened? Whoo! Where did it go, oh, Lordy!' "
Jones was the youngest of eight kids, born during the Depression in a log house in the Big Thicket, East Texas. His family didn't have electricity, but they did have a battery-powered radio. If you want to figure out where George Jones' voice comes from, he'll tell you — it all started there, drifting in over the static. "The only music we ever listened to out in the piney woods was Roy Acuff and the Grand Ole Opry," Jones says. "That was the only night of the week I was allowed to lay in the middle of the bed with Mama and Daddy, just long enough to hear Roy Acuff sing; then I had to go back to bed." In 1954, Jones was 22 when he got his first record deal with Starday Records in Beaumont, Texas. His producer was Pappy Daily. "Finally, Pappy Daily came in there and said, 'George, I've heard you sing like Roy Acuff, Hank Williams, Lefty Frizzell. 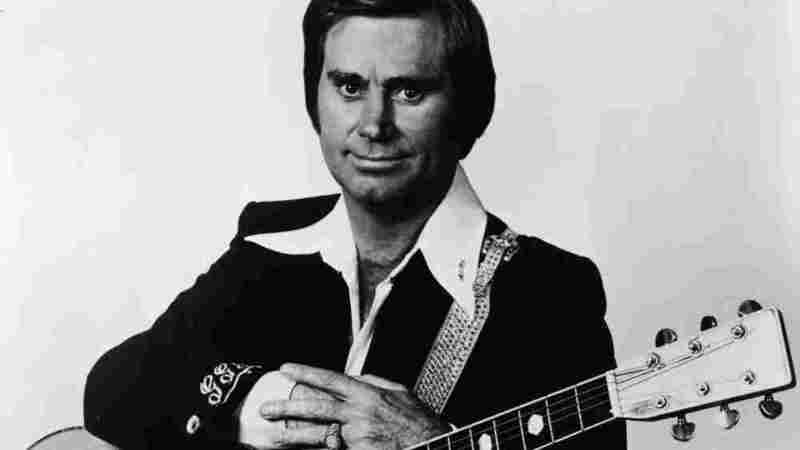 I just want to know one thing: Can you sing like George Jones?' I said, 'I thought you wanted to sell some records,' " Jones says, laughing. Whatever it is — the alchemy of Roy, Hank and Lefty, mixed with his own wrenching ache — Jones can pull and bend notes till they make you hurt. That voice has turned on a new generation of country singers, including country star Dierks Bentley, who says he is proud to call Jones a friend. He even hangs a George Jones bottle opener on the keys to his truck. And what he hears in these songs is pure emotion. "He digs into every lyric, every word and milks every emotion out of that word or syllable," Bentley says. "It's really unique. It's definitely his own style — no one else can copy it." "Do you have a favorite George Jones song?" Block asks.
" 'Walk Through This World With Me' is probably my favorite love song," Bentley says. "It's so sparse musically, and it leaves this huge space for his voice to really spread out in." Sometimes people say it sounds like Jones sings through clenched teeth. Bentley says it's like Jones is "holding that pain back." Either way, Jones sings what he knows: decades of hard drinking, drug addiction, violent rages, bankruptcy, failed rehab and failed marriages (most famously with his singing partner, Tammy Wynette) all filter into his songs. "I'm crazy over a ballad — one that's got a story, that's different from something you've heard before," Jones says. That brings us to "He Stopped Loving Her Today," a song about unrequited love that is taken to the grave: "He said I'll love you till I die / She told him you'll forget in time / As the years went slowly by / She still preyed upon his mind." After Jones finished recording this song, he told producer Billy Sherrill it was too morbid. "I said, 'Billy, I love the song,' but I said, 'It ain't gonna sell. It's too sad,' " Jones says. "But anyhow, how wrong could one person be? That turned out to be the signature song of my whole, entire career." Jones has made a career out of heartbreak and pain, but he says it's not who he is as a person. "It's not that you're unhappy when you're doing ballads," Jones says. "It's just that I try to live the song. During that three minutes or whatever it is, you try to step in that person's shoes. It seems for some reason the words tell you right away that you know how they feel."